Are you considering hockey for your child? Please read “Why Hockey?” below and explore the subjects that follow. If you are a veteran hockey parent, congratulations; you are a special kind of parent (but read on anyway)! Hockey is about teammates, friendship and the bond that can only come by sharing the journey of learning to play a game that is not like any other. Hockey is a game of skill and movement. It is about the sense of freedom and exhilaration of speeding across the ice. It is about the satisfaction of controlling the puck. It is about the joy of scoring goals. 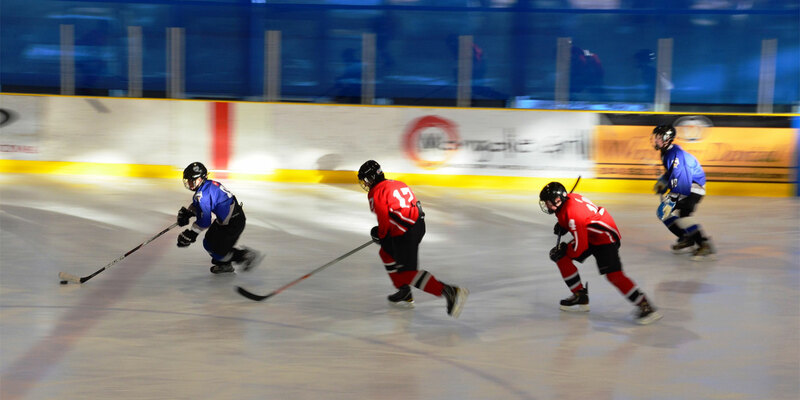 Hockey develops agility, balance, coordination, reflexes and strength. It is also fantastic exercise. It is one of the best cardiovascular games you can play. Hockey requires mental agility and creativity. It is a fast sport that requires quick thinking, the ability to focus and make decisions quickly in the context of a larger strategy. Hockey develops life skills: working towards common goals, working within a group, developing strong communication skills and listening skills, respect for authority and rules, self-confidence, patience and sportsmanship. In West Vancouver, only two of our 16 teams (Bantam A and Midget A) play in divisions where bodychecking is permitted. A number of important and significant changes have occurred to improve safety in hockey in the past few years. Most significantly, body checking has been eliminated at the Peewee age group. Coaches and safety managers teach and reinforce safe practices. Safety equipment has improved. Our understanding of the risk of concussions/head injuries has greatly improved, as has our ability to assess and respond to head injuries. Recent research shows that hockey is equal to other major sports, including soccer, and falls behind sports such as skiing/snowboarding with regards to head and other injuries. The majority of injuries (62 percent) among young hockey players (18 and under) are a result of checking. Injuries caused by body checks were the most common in the 14 to 16 age group, after players have been exposed to body checking. In BC, players do not bodycheck until Bantam (ages 13 to 14), and even then it is only introduced at the elite levels of the game – rep hockey. Up until two years ago, in many parts of Canada, bodychecking was introduced at Peewee (ages 11 and 12). A study found that Pee wee players in Alberta were 2.5 times more likely to get hurt and 3.5 times more likely to suffer a concussion than the Pee wee players in Quebec (where bodychecking was not permitted). The joint University of Calgary, McGill University, and the University of Laval study tracked 2,200 Peewee players from both provinces for the entire 2007-2008 season to measure injury frequency. In West Vancouver, only two of our 16 teams (Bantam A and Midget A) play in divisions where bodychecking is permitted. In fact, the majority of WVMHA minor hockey players play their entire minor hockey (from age 5 to 18) in non-bodychecking divisions and leagues. Hockey in West Vancouver is more expensive than soccer, but less expensive than skiing, swimming and other sports. We believe WVMHA offers the best value in hockey in the Lower Mainland. There are no membership fees or monthly dues. We operate a top-notch facility with reasonable practice times and uncrowded ice while providing access to some of the best professional coaches in the Lower Mainland. Of course! WVMHA is co-ed and there are many advantages to girls playing with boys -- especially at the younger ages. 3Does my child need to know how to skate? The general rule of thumb is that a child should be able to skate across the ice unaided. We do make exceptions, however, especially at the younger age groups. A good attitude is the major requisite. We do encourage all of our new skaters to take skating lessons in addition to their hockey lessons. 4What are the practice times? Our schedule is posted on the website under the "ICE SCHEDULE" button. When compared to other urban minor hockey associations, WVMHA offers excellent ice times with very few early morning practices. 5I have some questions. Who can I talk to? Email info@wvmha.ca and we will answer your questions promptly and/or direct you to the appropriate contact persons. 6Do our teams have to travel? Our house teams play in the Lions Gate League which is comprised of teams from North Vancouver, West Vancouver, Squamish, Whistler and the Sunshine Coast. Our rep teams play teams from throughout the Lower Mainland. 7What is the difference between House and Rep? House teams are our recreational teams. All H1 to H4 teams are house teams. Once the kids reach Atom age, then they have the opportunity to play on rep or "A" teams for which they must try out for. Rep teams play against tougher competition and travel more. They also play slightly more frequently. 8What does H1, Atom, Midget, etc. mean? These are age designations in hockey. H1 = 5 years old by December 31st; H2 = 6 years old; H3 = 7 years old; H4 = 8 years old; Atom = 9-10 years old; Peewee = 11-12 years old; Bantam = 13-14 years old; Midget = 15-17 years old.